Attempts to place the time necessary for an ancient Earth during the creation week (the Day-Age Theory) have proven unsuccessful. Similarly, attempts to insert the time needed for an old Earth before the creation week (the Gap Theory) also have failed. Subsequently, the idea has been proposed that perhaps geologic time might be placed after the creation week of Genesis 1. Those willing to offer such a suggestion, however, have been few and far between because of a major obstacle in the biblical record to such a compromise. As every student of the Sacred Scriptures is aware, the Bible contains lengthy genealogies. That these records play a vital role in biblical literature is clear from the amount of space devoted to them in God’s Word. Furthermore, they provide a tremendous protection of the text via the message they tell. That message is this: man has been on the Earth since the beginning, and that beginning was not very long ago. While genealogies (and chronologies) serve various functions in the literature of Scripture, one of their main purposes is to show the historical connection of great men to the unfolding of Jehovah’s redemptive plan. These lists, therefore, form a connecting link from the earliest days of humanity to the completion of God’s salvation system. In order for them to have any evidential value, the lists must be substantially complete. Yet some Bible believers—determined to incorporate evolutionary dating schemes into God’s Word—have complained that the biblical genealogies may not be used for chronological purposes because they allegedly contain huge “gaps” that render them ineffective for that purpose. Donald England has suggested, for example: “Furthermore, it is a misuse of Biblical genealogies to attempt to date the origin of man by genealogy” (1983, p. 155). John Clayton advocated the same view when he wrote: “Any attempt to ascribe a specific or even a general age to either man or the Earth from a Biblical standpoint is a grievous error” (n.d.[a], p. 3). Clayton also stated: “The time of man’s beginning is not even hinted at in the Bible. There is no possible way of determining when Adam was created” (n.d.[b], p. 2). In so commenting, most writers reference (as does Clayton) the nineteenth-century author, William H. Green (1890), whose writings on the genealogies usually are accepted uncritically—and acclaimed unjustifiably—by those whose intent is to insert “gaps” (of whatever size) into the biblical genealogies. Thus, we are asked to believe that the biblical genealogies are relatively useless in matters of chronology. We are told again and again that some of these genealogies contain gaps: but what is never pointed out by those who lay the emphasis on these gaps, is that they only know of the existence of these gaps because the Bible elsewhere fills them in. How otherwise could one know of them? But if they are filled in, they are not gaps at all! Thus, in the final analysis the argument is completely without foundation (1967, p. 3). If anyone wanted to find gaps in the biblical genealogies, it was Dr. Custance—who spent his entire adult life searching for a way to accommodate the Bible to an old-Earth scenario. Yet even he admitted that arguments alleging that the genealogies contain sizable gaps are unfounded. Gaps in genealogies, however, do not prove gaps in chronologies. The known gaps all occur in non-chronological genealogies. Moreover, even if there were gaps in the genealogies of Genesis 5 and 11, this would not affect the chronological information therein recorded, for even if Enosh were the great-grandson of Seth, it would still be the case that Seth was 105 years old when Enosh was born, according to a simple reading of the text. Thus, genealogy and chronology are distinct problems with distinct characteristics. They ought not to be confused (1979/1980, p. 12). Unfortunately, many who attempt to defend the concept of an ancient Earth have confused these two issues. For example, some have suggested that abridgment of the genealogies has occurred and that these genealogies therefore cannot be chronologies, when, in fact, exactly the opposite is true, as Jordan’s work has documented. Matthew, for example, is at liberty to arrange his genealogy of Christ in three groups of 14 (making some omissions) because his record is derived from more complete lists available via the Old Covenant. In the genealogies of Genesis 5 and 11, remember also that the inclusion of the father’s age at the time of his son’s birth is wholly without meaning unless chronology is intended. Else why would the Holy Spirit provide such “irrelevant” information? Plus, there are other important considerations. Observe the following in chart form. Speaking in round figures, from the present to Jesus was roughly 2,000 years—a figure obtainable via secular, historical documents. From Jesus to Abraham also was approximately 2,000 years—another figure that is verifiable historically. The only figure missing is the one that represents the time period from Abraham to Adam. Since we know that Adam was the first man (1 Corinthians 15:45), and since we know as a result of Christ’s testimony that man has been on the Earth “from the beginning of the creation” (Mark 10:6; cf. Romans 1:20-21), if it were possible to obtain the figures for the length of time between Abraham and Adam we then would have chronological information providing the relative age of the Earth (since we also know that the Earth is only five days older than man—Genesis 1; Exodus 20:11; 31:17). The figure representing the time span between Abraham and Adam, of course, is not obtainable from secular history (nor should we expect it to be) since large portions of those records were destroyed in the Great Flood. But the figure is obtainable—via the biblical record. Allow me to explain. Since Genesis 5 provides the ages of the fathers at the time of the births of the sons between Abraham and Adam (thus providing chronological data), it becomes a simple matter to determine the approximate number of years involved. In round numbers, that figure is 2,000 (see Arthur, 1999, p. 113) The chart then appears as follows. Some have argued that there are sizable gaps in the genealogies (e.g., Clayton, 1980a, pp. 6-7). But, where, exactly, should those gaps be placed, and how would they help? Observe the following. No one can place gaps between the present and the Lord’s birth because secular history accurately records that age-information. No one can insert gaps between the Lord’s birth and Abraham because secular history also accurately records that age-information. The only place one could put any “usable” gaps (viz., usable in regard to extending the age of the Earth) would be in the 20 generations between Abraham and Adam. Yet notice that there are not actually 20 generations available for the insertion of gaps because Jude specifically stated that “Enoch was the seventh from Adam” (Jude 14). An examination of the Old Testament genealogies establishes the veracity of Jude’s statement since, counting from Adam, Enoch was the seventh. Jude’s statement thus provides divinely inspired testimony regarding the accuracy of the first seven names in Luke’s genealogy—thereby leaving only 13 generations between which any gaps could be placed. In a fascinating article several years ago, Wayne Jackson observed that in order to accommodate the biblical record only as far back as the appearance of man’s alleged evolutionary forebear (approximately 3.6 million years), one would have to insert 291,125 years in between each of the remaining 13 generations from Abraham to Adam as provided in Luke’s genealogy (1978, 14:1). It does not take an overdose of either biblical knowledge or common sense to see that this quickly becomes ludicrous in the extreme for two reasons. First, who could believe that the first seven of these generations are so exact while the last thirteen are so inexact? Is it proper biblical exegesis to suggest that the first seven listings are correct as written, but gaps covering more than a quarter of a million years may be inserted between each of the last thirteen? Second, what good would all of this do anyone? All it would accomplish is the establishment of a 3.6 million year-old Earth; old-Earth creationists, progressive creationists, and theistic evolutionists need a 4.6 billion year-old Earth. So, in effect, all of this insertion of “gaps” into the biblical text is much ado about nothing. And therein lies the point. While it may be true on the one hand to say that an exact age of the Earth is unobtainable from the information contained within the genealogies, at the same time it is important to note that—using the best information available to us from Scripture—the genealogies hardly can be extended to anything much beyond 6,000 to 7,000 years. For someone to suggest that the genealogies do not contain legitimate chronological information, or that the genealogies somehow are so full of gaps as to render them useless, is to misrepresent the case and distort the facts. Numerous religionists have seen the abject failure of both the Day-Age and Gap theories, yet they remain as determined as ever to find a way to force evolutionary time into the biblical text. This misguided determination therefore causes them to formulate, modify, temporarily accept, and then abandon theory after theory in search of one they hope eventually will succeed. Unfortunately, many Bible believers have not yet come to the conclusion that the Genesis account is a literal, factual, and defensible record of God’s method of creation. And so, rather than accept that account at face value—as Christ and His inspired writers did—they constantly seek ways to alter it by appealing to one theory after another in the hope of ultimately incorporating geologic time into the biblical record. In many instances, the resulting “new” theories are little more than a reworking of the old, discarded theories that long ago were banished to the relic heaps of history because they could not withstand intense examination under the spotlight of God’s Word. One such theory making the rounds today is known as the “Modified Gap Theory.” Because of its increasing popularity, it bears examination here. Over the past three decades, one of the most frequently used lecturers within certain segments of the churches of Christ has been John N. Clayton, a self-proclaimed former atheist who teaches high school science in South Bend, Indiana. Due to his background in historical geology, Clayton has worked at a feverish pace to produce an illegitimate amalgamation between the evolutionary geologic record and the Genesis account of creation, the end result of which is an off-beat brand of theistic evolution that reflects his own “private theology” (see Francella, 1981). Consequently, he is recognized widely by those active in the creation/ evolution controversy as the originator of what is known as the Modified Gap Theory (see: Clayton, 1976a, pp. 147-148; Thompson, 1977, pp. 188-194; McIver, 1988, 8:22; Jackson and Thompson, 1992, pp. 115-130). Since John Clayton routinely propagates the view in his writings and lectures that the Earth is approximately 4.5 billion years old—the standard evolutionary estimate—he must, in some fashion, accommodate the Genesis creation account to this concept (see Clayton, 1990b, p. 130). Here, in his own words, is how his Modified Gap Theory attempts to make such an accommodation possible. Genesis 1:1 is an undated verse. No time element is given and no details of what the Earth looked like are included. It could have taken place in no time at all, or God may have used eons of time to accomplish his objectives. I suggest that all geological phenomena except the creation of warm-blooded life were accomplished during this time. There was no way God could have described amoebas, bacteria, viris [sic], or dinosaurs to the ancient Hebrew, and yet these forms of life were vital to the coal, oil and gas God knew man would need. Thus God created these things but did not describe them just as He did not describe a majority of the 110 million species of life on this planet. Changes took place in the Earth (but no gap destruction) until God began the formation of man’s world with birds, whales, cattle and man in the literal days of Genesis (Clayton, 1976a, pp. 147-148, emp. added). In his Does God Exist? Correspondence Course, he elaborated on what this means. Not only does the first verse give us the creation of celestial objects, but of a functional earth itself.... By the end of Genesis 1:1 there was a functional, living, working earth. If you had stood upon the earth at this point in time, you would have recognized it. Let us once again remind you that how long God chose to use to accomplish this creation is not revealed in this passage.... It is very possible that a living ecosystem operated in Genesis 1:1 to produce the earth. Bacteria may have swarmed in the oceans and giant plants may have lived in great swamps. Dinosaurs may have roamed freely accomplishing their purpose in being. The purpose of all of this would have been to prepare the earth for man. This living ecosystem would have produced the coal, oil, gas, and the like, as well as providing the basis of man’s ultimate food supply! (1990c, pp. 3,4, emp. added). I submit to you that Genesis 1:1 is not a summary verse. It is a record of God’s action which produced an Earth ready for man’s use. I further submit for your consideration that some time may be involved in this verse and that natural processes may have been used as well as miraculous ones to prepare the Earth for man (1982, p. 5, emp. added). The week described in Exodus refers to the week described in Genesis 1:5-31. The week in Genesis 1:5-31 describes the creation of man and a few forms with which man is familiar, but it is not a total description of every living thing that does [sic] or ever has existed on Earth (1976b, pp. 5-6, emp. in orig.). Whenever John Clayton is challenged regarding the Modified Gap Theory, his usual response is to cloud the issue by suggesting that he does not accept the standard Gap Theory (which no one accused him of advocating in the first place). He has said, for example: “I would like to emphasize that I do not in any way, shape, or form embrace the Gap Theory” (1980b). Yet, in his lecture, Evolution’s Proof of God, he stated: “In Genesis 1:2 I’m told by the Hebrew scholars that the most accurate reading is that the earth ‘became without form and void’ and some have suggested that maybe a tremendous number of years passed between the first part of Genesis 1:1 and Genesis 1:2” (n.d.[c], emp. added). I wonder—what would the average person call that “tremendous number of years” between Genesis 1:1 and 1:2? A “gap” perhaps? John Clayton’s “private theology” is replete with unscriptural concepts, discrepancies, and contradictions that bear examination. 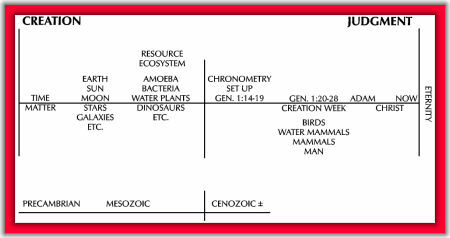 Notice—according to his chart—that the “creation week” does not commence until Genesis 1:14ff. Since this section of Genesis 1 has to do only with the events of day four and afterward, Clayton’s “week” of creative activity has only three days! Furthermore, Clayton’s Modified Gap Theory suggests that during the eons of time prior to the creation week God was building up a “resource ecosystem” by the use of amoebas, bacteria, water, plants, dinosaurs, etc. (see the chart below). Yet at other times, while attempting to defend his Modified Gap Theory, Clayton has contended that, in his opinion, the “most accurate reading” of Genesis 1:2 is that the Earth “became without form and void” (n.d.[c]). Which is it? Was the Earth generating or degenerating during this period? Obviously, it cannot be both. Earlier, I quoted Clayton as suggesting that in Exodus 20:11 Moses “avoids the creation question and concentrates on his own purpose” (1976b, p. 5, emp. added). This is a careless comment indeed. The purpose of Moses’ statement was not merely to establish the Sabbath law; it also was to provide an explanation as to the reason for that law. Exactly why were the Israelites commanded to observe the Sabbath? Because in six days God created the Earth and its creatures and on the seventh day rested. To state that Moses “avoids the creation question” is wrong. The divine writer did not avoid a reference to the Creator; “Jehovah” is specified. Nor did he avoid referring to the Lord’s action; he noted that God “made” these things. The Modified Gap Theory flatly contradicts Exodus 20:11 and Genesis 1. For example, Clayton has argued that the creation of fish (cold-blooded creatures) occurred in Genesis 1:1 (1976a, pp. 147-148), whereas according to Moses they were created on the fifth day (Genesis 1:20-23). The Genesis record states that creeping things (which would include both insects and reptiles) were brought into existence on the sixth day (1:21,24), but the Modified Gap Theory places them in the time period before the creation week. John Clayton simply rearranges the Genesis record to fit his own evolutionary presuppositions—without any regard whatsoever for what God had to say on the matter. The only way that Clayton can hold to his Modified Gap Theory and his “private theology” is to convince people that his way of translating Genesis is the correct way. He has attempted to do exactly that for thirty years. In order to succeed, he has found it necessary to give people an entirely new vocabulary. This is the case with many false teachers. They realize they never will be able to reach the masses by using correct, biblical terminology, so they invent new terms, or offer drastic reinterpretations of old ones, in an attempt to make their ideas appear respectable. The Modified Gap Theory, with its accompanying off-beat brand of theistic evolution, rests upon the (mis)interpretation of two Hebrew words, bara and asah, employed in Genesis 1-2. Here is what Clayton has said about them, and why they are so important to his theory. In the Hebrew culture and in the Hebrew language there is a difference between something being created and something being made. The idea of creation involves a miraculous act on the part of God. It is not something that man can do, nor is it something that can occur naturally.... The Hebrew word used in Genesis 1 to describe this process is the word bara. As one might expect, this word is not used extensively in the Bible, in fact, it is only used in verses 1, 21, and 27 in Genesis. The other concept in the Hebrew culture and in the Hebrew language that is used in reference to things coming into existence involves the process of producing something naturally. The idea is that something came into existence because of planning, wisdom, and intelligence, but not as a miraculous act of God. Many times acts of men are described in this way. The Hebrew word asah is the main Hebrew word translated this way in Genesis 1. It is vital to a proper understanding of Genesis that these two words not be confused because much understanding is lost and considerable contradiction with the scientific evidence is generated when the words are not distinguished from each other (1991, pp. 6-7). We have pointed out that the Hebrew word bara normally means to create something out of nothing while the word asah usually implies the re-shaping of something that was already in existence.... [T]he normal use of the word bara and the normal use of the word asah are distinctly different and this difference is important in one’s interpretation of Genesis 1 (1979, pp. 2-5). The following detailed summary from John Clayton’s own writings should clarify why this distinction is so important to the success of his Modified Gap Theory. God initiated the Big Bang, and the Universe developed according to evolutionary theories (Clayton, 1991, p. 8). Sometime after the initial creation, God then began to form and make (asah) things. As Clayton has stated: “It is important to recognize that this process of creating...is described in Genesis 1:1-3. Verse 4ff. deal with something all together [sic] different—the making, forming, and shaping of the created earth. Creation does not occur again until animal life is described in verses 20 and 21” (1991, pp. 8-9). Beginning in the time period called Day 5, God allegedly began to make new things (Clayton, 1991, p. 9), which presumably would include marine life, birds, and man, but would exclude light, oceans, atmosphere, dry land, planets, stars, moons, and beasts of the field—all of which supposedly were “created” (bara) in Genesis 1:1. Man’s spiritual part then was created (bara) in God’s image (1:27), and his physical part was formed (yatsar not bara) from the dust of the ground (Clayton, 1991, p. 9). By the end of Genesis 1, God’s “creating” and “making” were complete, but “there is no indication in the Bible that the seventh day ever ended” (Clayton, 1990a, p. 11). Because there are a few isolated exceptions where the context seems to indicate that the word bara or asah has been used in a different way than the application we have just discussed, there are those who maintain that one cannot scripturally maintain the applications of these words as we have presented them in reference to Genesis 1. The Hebrew language, as most of us recognize, is a language which can be interpreted only in its context (1979, p. 4, emp. added). Clayton also has confessed: “Some may object to this superliteral interpretation of bara and asah by responding that there are exceptions to the usages I have described in the previous paragraphs. Such a criticism is valid” (1990d, p. 3, emp. added). Second, Clayton’s “few isolated exceptions” are neither few nor isolated. Furthermore, they obliterate his artificial distinction in regard to bara and asah (which often are used interchangeably throughout the Old Testament and do not always have the strict interpretation that Clayton has placed on them). Notice the following. The Hebrew words for “create” (bara) and for “make” (asah) are very often used quite interchangeably in Scripture, at least when God is the one referred to as creating or making. Therefore, the fact that bara is used only three times in Genesis 1 (vv. 1, 21, and 27) certainly does not imply that the other creative acts, in which “made” or some similar expression is used, were really only acts of restoration. For example, in Genesis 1:21, God “created” the fishes and birds; in 1:25, He “made” the animals and creeping things. In verse 26, God speaks of “making” man in His own image. The next verse states that God “created” man in His own image. No scientific or exegetical ground exists for distinction between the two processes, except perhaps a matter of grammatical emphasis.... Finally, the summary verse (Genesis 2:3) clearly says that all of God’s works, both of “creating” and “making” were completed with the six days, after which God “rested” (1966, p. 32, emp. in orig.). ...it always means to create, and is only applied to a divine creation, the production of that which had no existence before. It is never joined with an accusative of the material, although it does not exclude a pre-existent material unconditionally, but is used for the creation of man (ver. 27, ch. v. 1,2), and of everything new that God creates, whether in the kingdom of nature (Numbers xvi.30) or of that of grace (Ex. xxxiv.10; Ps. li.10, etc.) [1971, 1:47, first emp. in orig. ; last emp. added]. Arthur, Kay (1999), “The Overlapping of the Patriarchs’ Lives,” Genesis: Becoming the Friend of a Faithful God (Chattanooga, TN: Precept Ministries). Clayton, John N. (no date-a), “Biblical Misconceptions and the Theory of Evolution,” Does God Exist? Correspondence Course, Lesson 4. Clayton, John N. (no date-b), “The History of Man on Planet Earth,” Does God Exist? Correspondence Course, Lesson 8. Clayton, John N. (no date-c), Evolution’s Proof of God (taped lecture). Clayton, John N. (1976a), The Source (South Bend, IN: privately published by author). Clayton, John N. (1976b), “ ‘Flat Earth’ Bible Study Techniques,” Does God Exist?, 3:2-7, October. Clayton, John N. (1979), “The Necessity of Creation—Biblically and Scientifically,” Does God Exist?, 6:2-5, May. Clayton, John N. (1980a), “Is the Age of the Earth Related to a ‘Literal Interpretation’ of Genesis?,” Does God Exist?, 7:3-8, January. Clayton, John N. (1980b), “A Response to Evolutionary Creationism” (taped lecture). Clayton, John N. (1982), “Where Are the Dinosaurs?,” Does God Exist?, 9:2-6, October. Clayton, John N. (1990a), “One Week Creation—of Man or of God?,” Does God Exist?, 17:5-12, July/August. Clayton, John N. (1990b), The Source (South Bend, IN: privately published by author). Clayton, John N. (1990c), “The History of the Earth,” Does God Exist? Correspondence Course, Lesson 9. Clayton, John N. (1990d), “How Did God Create Man?,” Does God Exist? Correspondence Course, Lesson 7. Clayton, John N. (1991), “Creation Versus Making—A Key to Genesis 1,” Does God Exist?, 18:6-10, January/February. Custance, Arthur (1967), The Genealogies of the Bible, Doorway Paper #24 (Ottawa, Canada: Doorway Papers). Francella, Kevin (1981), “Former Atheist Says Bible and Evolutionism Are Compatible,” The Sunday Press, Binghamton, New York, May 17. Green, William H. (1890), “Primeval Chronology,” Bibliotheca Sacra, 47:294-295, April. Jackson, Wayne (1978), “The Antiquity of Human History,” Words of Truth, 14:1, April 14. Jordan, James (1979), “The Biblical Chronology Question—[Part I]” Creation Social Sciences and Humanities Quarterly, 2:9-15, Winter. Jordan, James (1980), “The Biblical Chronology Question—[Part II]” Creation Social Sciences and Humanities Quarterly, 2:17-26, Spring. Keil, C.F. and F. Delitzsch (1971 reprint), Commentary on the Old Testament (Grand Rapids, MI: Eerdmans). Kitchen, Kenneth A. and J.D. Douglas, eds. (1982), The New Bible Dictionary (Wheaton, IL: Tyndale), second edition. McIver, Tom (1988), “Formless and Void: Gap Theory Creationism,” Creation/Evolution, 8:1-24, Fall. Thompson, Bert (1977), Theistic Evolution (Shreveport, LA: Lambert). Thompson, Bert (1995), Creation Compromises (Montgomery, AL: Apologetics Press).